Parents can cozy in the ballroom while the kids enjoy carnival favorites like face painting, entertainment, crafts and more. Treat yourself to a complimentary bag of kettle corn and a tasty cup of hot chocolate. Chris Thompson & Coral Creek add a little kick to the party with Bluegrass and Americana classics. Mocktails, cocktails, “Welcome Winter” mixers, and beer specials make for a perfect, all-ages affair to prelude the Lighting of River Run Village. 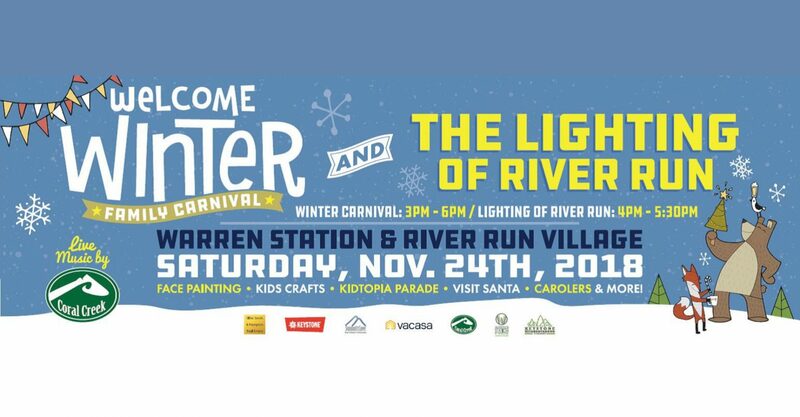 The Tree Lighting at River Run starts just after 5PM, so bring the whole family and make a night of it! Better yet, this is a FREE event!